My father, Arthur Burgess, was the Chief Clerk and Cashier of the LSH when it ceased to operate at Canning Place, and their office was moved to Water Street – Oriel Chambers, I think. Despite the closure of the home itself, they were still in charge of the Training Ship Indefatigable [then land-based near Menai] and also the King George V Fund for Sailors. The LSH was closed down, not for lack of sailors, but because its open balconies could not be fire-proofed to current safety standards. You may like to know that the rooms were always called Cabins and each floor was called a Deck. This was to use familiar terminology for sailors, many of whom might speak little or no English. When LSH closed, my father was given an early engraving of the building, and I attach three photographs. You may be able to date it from the bustles worn by the women in the pictures, and the beautiful gates are quite clear. 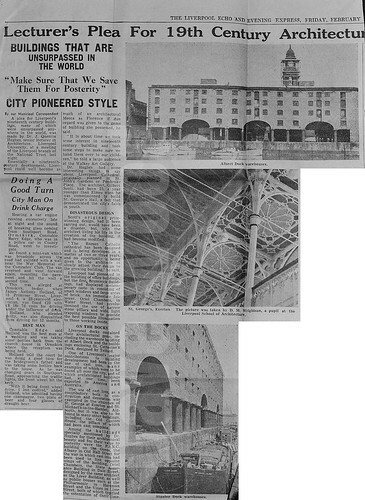 At the time of the closure, the Echo printed an article [see attached] and the man on the balcony, or correctly Deck, is my father. The date of the Echo article was Monday 19th January 1970. I also have in my possession glass photographic negatives of the two training ships, each named Indefatigable in turn. You may like to see them. Scanned images attached. Just before the closure a photograph was taken inside the LSH, featuring the cast of the television serial “Family At War”, which was current at that time, and was set in Liverpool. My son has a copy of this. You may have no professional interest in television, but the photograph shows a clear view inside the LSH. As far as I understand this publicity photograph was never used by Granada. The news cutting has a piece missing, but it’s still an interesting read. Once again, many thanks to Roger Burgess for supplying the images and information. “Gabriel Muies, Cllr Sharon Sullivan, John Hinchcliffe (World Heritage Officer) and myself travelled to Sandwell to meet with Cllr Ian Jones today. We were very warmly welcomed by Cllr Jones and explored the issues with him. We also had a chance to speak to the Leader of the Council, Cllr Darren Cooper in whose ward the Pooley Gates currently reside. The meeting gave me great hope that we will be able to bring the gates home. There are key issues to discuss with English Heritage and our focus will now be on convincing them that delisting, removal and relisting should be allowed. My thanks to Cllr s Cooper and Jones for their welcome. Thank you Malcolm. Fingers crossed! A couple of years ago, I bought George Chandler’s Liverpool (1957) book off Ebay. I was leafing through the pages and a news cutting fell out. It was an article by the hugely respected Quentin Hughes who championed the preservation of Liverpool’s buildings. The article predates Hughes’ seminal work, Seaport by 2 years. It’s still relevant now. I wonder what Quentin Hughes would think of some our recent developments? Malcolm Kennedy reports: The delegation from Liverpool will now be going down to Sandwell on the 27th to meet Councillor Jones.